I did it, I did it, I did it!!! I completed an aquathlon at Lakeside tonight! My preparations started last night, when I tried to gather together all of my possessions. I didn’t think I’d need much stuff, but my list was longer than I anticipated when I started writing it. This morning, I decided to replace the laces in my favourite trainers (Brooks Pure Flow Cadence) with elastic laces. This would seem to be an easy swap to make, but the laces were really long, so I had to do a little handiwork with scissors and sellotape. Then my cheerleader turned up – thank you, Irene for being such a great supporter. At about 6:30pm, we got into the water. The slope was very slippery and I was nervous that I might fall over, so I went in very slowly. It was warmer than I expected, so that was a good start. I floated on my back for a bit and then rolled over and floated on my front. It helps to relax me, but I didn’t want to stay like that for too long in case anyone thought I as drowning! I swam over to the start area, and took care to position myself at the back of the pack, as I knew that I would be one of the slowest swimmers. The swim started out OK (although I think I tried to swim over someone else), but I think I needed more of a warm up and that I should have gone slower. It definitely did not feel as easy and relaxed as it had on Tuesday morning, which was a shame. I rounded the first buoy, but my goggles had really fogged up, so I had to tread water for a bit to rinse them off, then I swam past the exit and headed along the front straight. I will admit that I did a few strokes of breaststroke (but not many), just whenever I needed to catch my breath. I could see Irene on the edge of the water cheering, so I gave her a quick thumbs up and then swam on. At about that stage, some of the fastest swimmers started lapping me, but I was feeling confident as I knew I wasn’t the last swimmer in my wave and plenty of the people from the other group were still some way off lapping me. I was happy to have finished the whole of the first lap, but the extra bit back to where we had to leave the water felt like it was taking forever. I managed to maintain my stroke, but was glad that it was nearly time to get out of the water. When I got to a shallow area, I started to unzip my wetsuit to flood the front. I quickly moved out of the water and started stripping. I got my arms out of the suit and started to remove the legs when the combination of wet grass and jelly legs got me and I fell over. I swiftly removed the rest of my wetsuit and then put on my shoes. I had made a decision not to wear socks, so I rubbed my feet a bit and then slipped my shoes on. I took off my hat and goggles, grabbed my glasses and put on a cap. I guess for a speedier transition I should have abandoned the cap, but I’ve never run in my glasses before and as it was raining quite hard by that stage, I wanted some protection in the hope that I would be able to see. It was great to be running on the old parkrun route as it’s where my love for running developed. It was also interesting to see the changes that have taken place… and good to have a distraction from the fact that my breathing was horrendous for the first part of the run. It wasn’t long before some of the sprint distance men began to overtake me, and then one of the faster ladies also ran past. I came out of the bowl and realised that there was another woman ahead who looked like she was not running as fast as the others. I got onto the final 300m, I realised that if I pushed harder I could overtake. I put in my best effort and managed to hunt down the other lady (who is also a Ladyhiller). I felt so pleased when I had finished. If someone had told me four months ago that I would complete a 400m open water swim as part of an aquathlon, I would have found it difficult to believe. I can’t remember my official time – I think it was about 27 minutes. Stu finished in about 18 minutes and was the first novice finisher. I think I was the first novice female, but there weren’t many of us in the category, so that’s not particularly special. What is special is that I’ve now done a duathlon and an aquathlon… what next? Swicle or just a full triathlon? The answer is a triathlon. Stu and I have both entered HOWSC triathlon on 29th September. 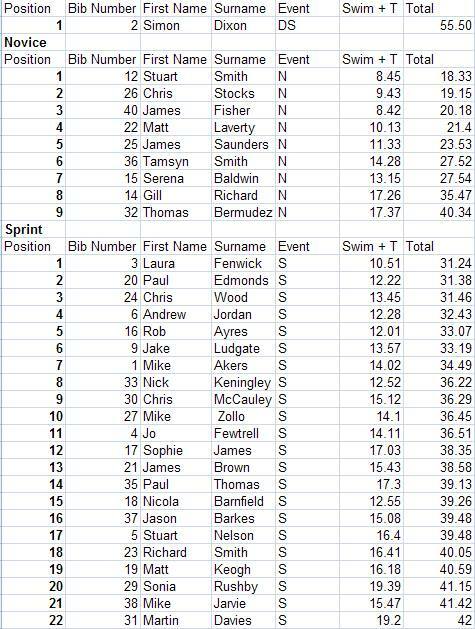 I think I’ve put down for novice, but after tonight’s success, I need to decide whether I can improve my swimming to be able to do 750m by then… any thoughts?